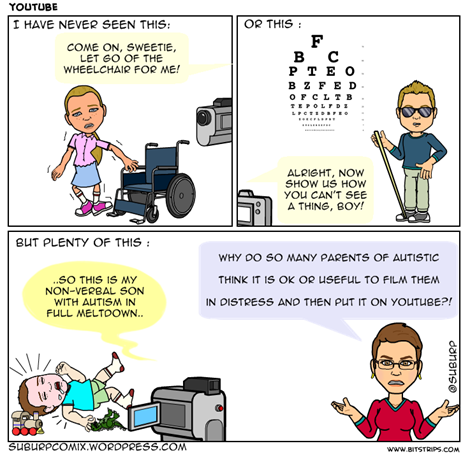 sh*t autism parents do– autistic kids on youtube. This may or may not become a series also. Just like “sh*t people say about autism”, there are a few things parents of autistic kids do.. that simply are not right in my eyes. There may be a minor educational effect, very similar those of the ‘see this family suffer!’ stories we see on the media, but displaying their own child in distress on the internet for anyone to see, judge and possibly ridicule – I just don’t understand why parents do this?! I already see enough risks with the full exposure blogs that have photos, names and places of ANY child, let alone children with disabilities. There have been cases of abuse of imagery, nasty troll comments and so on. Once you put something on the internet, even if you delete it, copies are in circulation forever. THINK before you expose your child on the internet! This entry was posted in autism, general, parenting and tagged ASD, asperger's syndrome, autism, blogging, blogs, children, copyright, disability, humilation, internet, misuse, parenting, photos, youtube on October 20, 2013 by starfish. I posted this on the YouTube of a parent who has been doing this to their child. They are the type that lash out at anyone who highlights that others who take their child’s inability to consent to be posted on Youtube. I am not sure if posting the link would be a good idea, because they might start a flame war, go to websites to dance around and hold a tantrum that they’re not getting their way in using their child. I posted a link to here on their youtube. That picture of the girl being made to walk from the wheelchair really disturbed me, the only reason I can gather for that besides it being disturbing is I’ve been watching too many horror films. I see that and expect a puppet in a suit with swirls painted on his face to appear asking if I want to play a game. There’s a letter or word missing in the last frame. It should be ‘autistics’ or ‘autistic children’, not just ‘autistic’. I meant to put autistic children, although it’s probably true for older autistic teens and even adults too, sadly. I will correct it when I get a chance. I had come across that blog quite a while ago, and it struck me as a particularly disturbing example. I have a strong opinion on ‘the case’ it has become too, and have blogged and commented about it, but I think as it is now, I’d rather try NOT contribute to produce further digital footprint of what would be the most extreme case of disrespect of privacy of an autistic child – (the videos were pretty painful too) – with the most extreme of developments. In the interest of the daughter, I have removed the name. Most people will know who you are talking about. AS a parent of 2 Autistic kids I can say we have never done this. But we do have tape of some of the things our son has done and shared them with his doctors and therapists in an effort to understand what we can do to help him. once the professionals have seen the video we destroy it so not to embarrass him. That’s a very different thing, obviously. Although from experience, the best option – during meltdown – is either to give some space or give comfort in whatever the appropriate way, maybe a recording of certain behaviours can indeed help a specialist identify what even triggers them, enforces or helps diverting them. I agree with you completely. 100%. I want to respond to your question “why?” ( not that it matters. It is still wrong.) I don’t know whether your question is rhetorical or if you are really searching for understanding, but I want to share something. Last evening, I had a very strong urge to record my 14 year old autistic child screaming at me and making angry growling sounds while I was driving the car. The urge was so strong that I grabbed my phone and frantically looked for the recording app. Then I asked myself why? To put on Facebook? Of course not. To show who? The child’s father? My mother? Why? The therapist? She’s seen it. To show my child? Maybe- no. But the urge tells me that I might get relief, sympathy, help, comfort if the right person heard this. Who? I don’t know. That urge is selfish and childish. If I need those things, I need to find them- not shoot an arrow into the air and hope it lands I know not where, at the expense of my child’s privacy. I have to remember that I am the mom, and act like it. My question was probably only part rhetorical and I am glad that you shared how the impulse to record a meltdown feels and what a parent might hope to achieve. But you have gone further in the reflection about it and answered the question “should I ..?” yourself. I don’t imply only selfish intent for this. I know many parents are lost, feel alone and are hoping for support, understanding and answers. Again, I think you are very right to point out that it would be a very vague approach to actually get those answers. There are better ways. THANK YOU. I’m not a parent (yet), but I do have Asperger’s, and I was bullied throughout my entire childhood (and was finally diagnosed with Asperger’s at age 20 back in 2009). I just don’t get why parents think this is okay to do, especially given that their children are going to grow up someday and possibly still be affected by these things. YouTube users can be notorious trolls, and it’s easy for this to lead into cyberbullying and a continuation of the stigma on autistic people because it’s something that’s easy to make fun of. I think some parents are not quite aware to what extent the internet can turn anything into something ugly, purely to the amusement of some thoughtless trolls and their followers. And that can have lifelong consequences in the worst cases. But I also question the intent. I do not see how it can benefit the child in anyway. The gratification for the parent can only be temporary, and the educational value is probably zero. Oh gosh, you have? I’m always genuinely surprised whenever someone tells me they’ve read it! Sorry to slip this in off topic, but you asked on the Autism Gadfly blog why Mitchell is so full of hate. I know why. He was brought up that way. When confronted with the DX of Autism and the consequent accusation that it was her fault, his mother – instead of telling the diagnoser(s) where to stick that attitude, she decided they were right and set about trying to cure him as a priority instead of accepting the condition. This was back when every parent with an Autistic child was blamed (the 1950’s) and the treatments available were nowhere near what we have now for improvement (not cure). Mitchell sees no difference between the special schools of his day and today simply because he can’t believe they have changed in any way. He lives in that period even now and hates any attempt to give credence to anything positive about Autism. Thank you. Yes, that helps understanding his position. I had the distinct feeling that only extreme personal hurt could have led him to pick up a somewhat pointless fight. I certainly do not adhere to the position that autism is a blessing as, even for ‘high functioning’ autistics our society reserves a lot of rejection and obstacles. But the idea of neurodiversity seems the best approach to me to accept differences and work with them today in the benefit of ALL autistics, rather than just focus on cure or elimination of autism – in what seems today a far away or never attainable future setting. I can sort of see how his own pain leads him to not only dispute but actually attack the movement of those who chose a positive viewpoint of life with autism but I feel it’s very counter-productive. One should hope he would see the greater picture of integration of people with disabilities of all kind, our society opening up to the differences that are existing but can be enrichening. If we open up to the different ways of thinking, of communication, of living – so much more can be done even for those who are now considered ‘severe’ cases that are otherwise condemned to live a miserable life, while we hope for a “cure”. I knew of the divides in the so-called ‘autism community’ but the bile that manifests itself at times on one side or the other (of the many, many groups this ‘community’ actually represents) never ceases to surprise me. And it’s sad. Oh, yes! This comic hit the spot! I adore how clear your comics make your ideas. Easy to grasp, easy to share, genius! We have always loved to take photos and videos of our son. It’s natural to want to share, but essential to respect the child. Children deserve dignity and respect. Oh I LOVE to show off my (very photogenetic) son! but I have taken the decision to put his privacy first. I have never watched these videos for the very reasons you state. There is also some dreadful TV footage of a boy having a meltdown that Channel 9 have. They they pull out every time there is an autism story, much to my dismay. The whole thing was filmed and broadcast with the mother’s consent. There is a mythology that all autism parents are sensitive to their child’s needs but sadly many of them are not – often they’re more interested in garnering sympathy for themselves. It’s all about them and how this imperfect child has disrupted their ‘perfect’ life. I write about my son in the ‘Australian Autism Handbook’ but I do use a pseudonym and I am very, very selective about what stories I tell. i don’t usually watch the clips either, but I have to mention that one particular blog struck me with video footage one time, with full disclosure of name and places of a teenage autistic girl. after about 2 or so years of ‘research’ on autism, I have completely abandoned the idea that we are all just one big autism community (see here: https://suburpcomix.wordpress.com/2013/09/25/mommy-war-zones/) It’s not only that I disagree with ‘parenting styles’ but some of the so called treatments and therapies are SO SICK, i can’t but judge them harshly for inflicting it on their children… not as parents, but as humans. If you watch this, turn your volume down! There are more of these…I find them particularly disturbing. I don’t want to censor you but I’ll probably figure out a way to deactivate the video..
I’d rather not promote any of those videos that I am so strongly opposed to. .. i mean – 22 minutes ?! “for educational purposes only” WT..f? that is shocking and, frankly, a very bad example by a somewhat big blogger if I am not mistaken.. I understand. Can you just delete it? Reblogged this on Heart of an Aspie. Your post reminded me of this stupid video I saw last week. I could hardly stomach it. “Kathy Lee Gifford makes an Autistic kid cry” Now that is a nauseating title. You might enjoy listening to Howard Stern tell the story of how he came across this video while he was on vacation more than watching it yourself. Either way, people really know how to make things worse. It’s unfortunate when those people are parents. I hardly ever look at those videos, but I frequently get ‘recommendations’ because I watch other ‘autism’ related videos on youtube. Before publishing this comic, i made a few researches via google. There are A LOT out there. Youtube commenters can be particularly vile and many hits do not mean many interested and concerned parents but more likely, juvenile trolls watching your video scanning it for material exploitable for humiliation and fun. I remember the title of the ‘makes .. cry’ but haven’t actually watched it. I know people are naive but those sensational titles, for private videos as much as when posting a media snipped outrageously, can completely backfire for the victim, or over time, for the child having the meltdowns for the world to see. I just wish people would stop. This is something parents in general have a problem with, and that kids with disabilities are more vulnerable to, thanks to societal ableism. But I lost track of the number of times my parents thought it was “funny” to relay in public embarrassing stories or photos of my childhood. Or, more recently, to post them on Facebook. I recently got into a fight with one of my parents over it, because they thought it was funny to post in great graphic detail of me getting a bad case of food poisoning as a kid. What these parents and mine have in common is selfishness. They only think about what they get out of it – sympathy in the case of the parent showing what a “little monster” their kid is being (but, conveniently, not including what led up to the kid’s meltdown – I would not at all be surprised if at least some of these parents purposefully provoked a meltdown for Youtube sympathy fodder), yuks in the case of a parent showing a photo/telling a story that humiliates their child, etc. They don’t consider the fact that this will follow their kid forever. They don’t consider the humiliation the kid has to suffer at the hands of their own parents. This isn’t a huge jump of empathy. It’s not me as a woman trying to imagine what a dude feels like about an issue. It’s not a man trying to imagine what sexism feels like. It’s not alien to their experience. Rather than walking in their kids’ shoes to imagine what having a disability is like, they just have to remember their own shoes 20ish years ago – everybody has had a time where they felt someone in power over them was purposefully embarrassing them. Why would you want to inflict that sense of helpless humiliation on your kid? Why would you do it in a way that’s going to follow them around? Why are your wants for some sympathy or a few laughs more important than your kid’s emotional wellbeing and their reputation as an adult? I mean, seriously, in my country, we don’t let kids who’ve killed people have their names published. Because we don’t want something someone did at 12 or 13 to follow them forever. People grow up a lot between 12 and 20, and people can reform a lot in those years, and it sabotage’s the kid’s chance at rehabilitation if you publish their names so that everyone looks and says, “Oh, that person is a murderer. I don’t want them in my college.” And the country, in general, thinks it’s not fair to the kid. It doesn’t give them the chance to turn their life around and develop into a good person. So, why are these parents not extending the same protection that my country extends to kids who murder to their own kids, who are guilty of no crime at all? good point. there has to be a limit of decency and tact with regards to what you tell others when it comes to ‘funny stories’ – and also, limit the public to those you can actually trust. it IS as selfish to use your kid as a prop in a story you use to amuse others, as it is when you use their meltdown to educate the public or whatever. I mean, we all know what a meltdown looks like, really. It may be particularly overwhelming, violent, loud, sudden etc, but it really doesn’t need much illustration other than those words. showing your kid, maybe repeatedly to make your point – how much YOU as a parent are suffering – is simply not ok, useful and ethical. Interesting point about criminal records/naming of underage murderers.. i guess that principle is hard to keep up in times of the internet as well..
… so I can gripe about aggravating students, but I remove all identifying info if I do. I’m allowed to be aggravated. I’m not allowed to take it out on my student. I cannot agree more. Once you post it online, you no longer have control over who gets to see it. A perfect example was an enormously cute video of my nephew, put on Facebook by my sister-in-law. Now she has her Facebook profile completely private, only friends can see her content, nobody else. So you’d think that would OK, right? Wrong. A good friend of hers thought the video was so cute, that HE shared it with HIS friends. And HIS profile is completely public. So ANYONE could go on his Facebook profile and see that video. And share the video with THEIR friends. And on and on. I have published a couple of pictures of children stimming on http://what-is-stimming.org/gallery. With permission from both the parents AND the children. Because the children should have a say in what gets published about them. And even then it’s tricky. Because children don’t think about long term consequences like getting a boyfriend or finding a job. Parents should be thinking about that on their behalf. And as your search shows, too many parents don’t. There is a lot of talk about teenage sexual poses finding their way into the galleries and archives of the internet. We all need to understand this is the case for every single photo, article, statement, tweet, status etc as well. Showing your own children in distress – and quite honestly, holding a camera instead of actively trying to lessen the distress..- I just don’t understand it. But ALL parents seem to think throwing their kids pictures into the public is fair game. It goes soo much further than carrying a brag album or sending pics to relatives and friends.. Even if the baby pic was cute, how does it feel to have it picked up in 1000s of different variations in memes all over the internet? Probably not quite right. Yes, it’s a spin off from the survey I did on stimming behaviours a month ago! We’ve decided to make it into a website. It’s still early days though!